Quinoa is a relatively new grain but is in everyone's shopping trolley and store cupboard. What's the deal in quinoa? 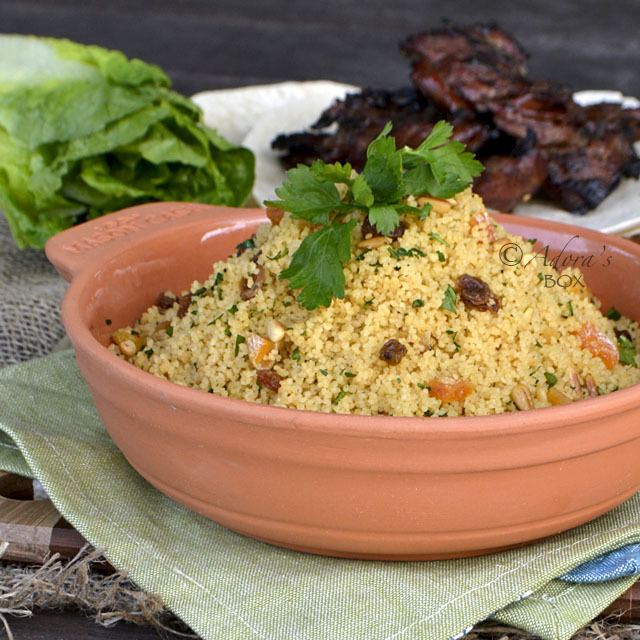 The food and Agricultural Organization of the UN has declared 2013 as The International Year of the Quinoa. It is actually a seed rather than a grain, is low in carbs, high in protein, has neither fat nor cholesterol content and is gluten free. These tiny, tiny seeds are touted as the new superfood. The list is long and very scientific and I get muddled by that sort of thing so I'll just say that it is really good for you. Quinoa has a bitter edge to it when not washed properly. The best way to wash it is on a sieve under running water. The seeds has to be rubbed against each other. It is usually parboiled before using in recipes. These little seed have have their own "pop-up timer". It is done when the tails come out. I like it with a bit of bite, just with a translucent ring around it. It tends to end up in a wet mush when overcooked. It does not have much taste on its own but is a good base for salads and pilafs. 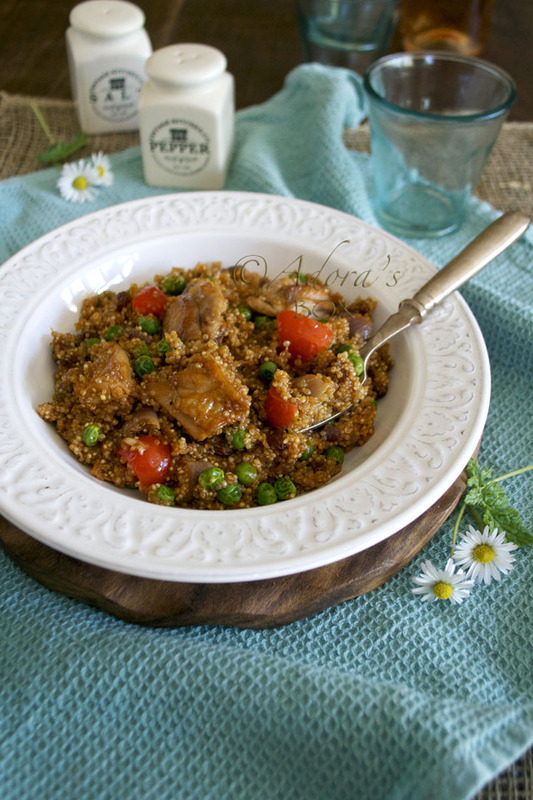 Treat it as you would grain and you get a low carb dish. With that in mind, I used the grains instead of rice and cooked it in a very satisfying, all-in-one dish quinoa con pollo. If you think quinoa is bland, this will change your mind. Place the quinoa in sieve. Rinse under running water, rubbing the grains with your fingers, for at least two minutes to remove the bitter taste. Strain very well. Put the quinoa in saucepan and cover with water and bring to a boil. Simmer for five minutes then strain again. Season the deboned chicken thighs with 1 tsp. of salt. Heat up a tbsp. 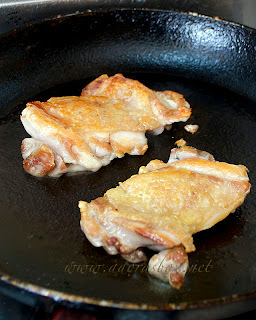 of olive oil and pan fry the chicken, skin side down first. Fry on medium high heat for about 3 minutes on each side until well browned but still moist inside. Cut into cubes. Heat up a clean pan and fry the garlic in 2 tbsps. of olive oil until golden. Add the onions and sauté until translucent. Add the strained quinoa. Sauté until fairly dry. Add the tomato puree, chicken, sultanas, paprika, black pepper, cayenne, sweet red pepper and stock. 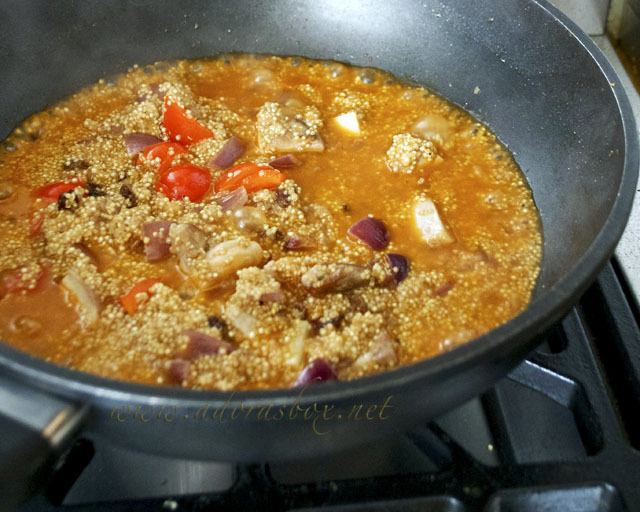 Bring to a boil, cover and simmer until the quinoa is cooked. 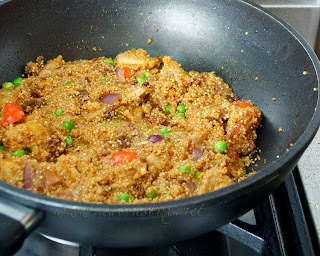 I like my quinoa with a bit of bite so I cook it just until the tails are starting to come out. 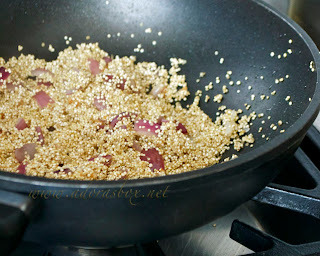 If you want it softer, cook further until the quinoa is completely translucent and the tails have come out. 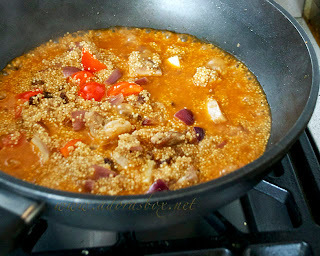 You can add a little more stock if the mixture becomes too dry before the quinoa is cooked. Remove the lid, add the green peas and turn the heat up to let the mixture absorb all the liquid. Adjust the seasonings. Turn the heat off. Put the lid back on and let rest for 5 minutes. Fluff up with a fork before serving. No, couscous is a small pasta. Quinoa is an ancient grain. It is gluten free and one of the only non meat sources that is a "complete protein". 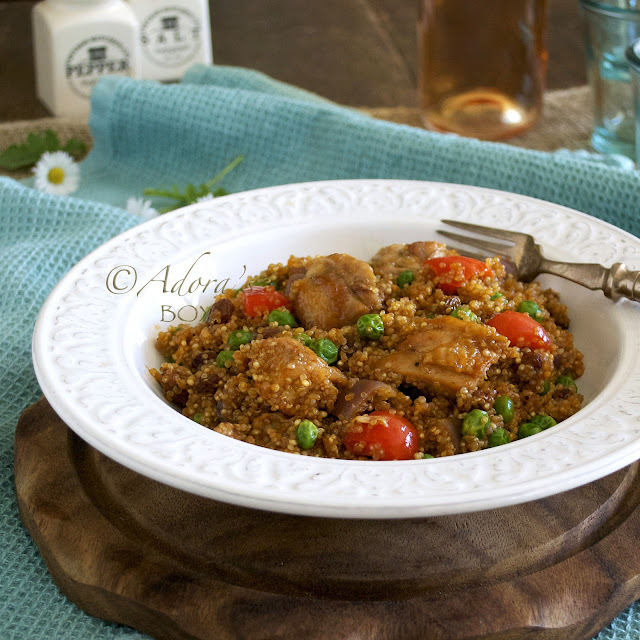 I absolutely LOVE Arroz Con Pollo so seeing it made with quinoa instead...amazing idea! Yum! I love quinoa! It's such a fun food and also such a good flavor soaker upper that it can be used in practically any dish. 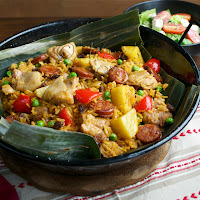 This one look delicious! Love love love!!! 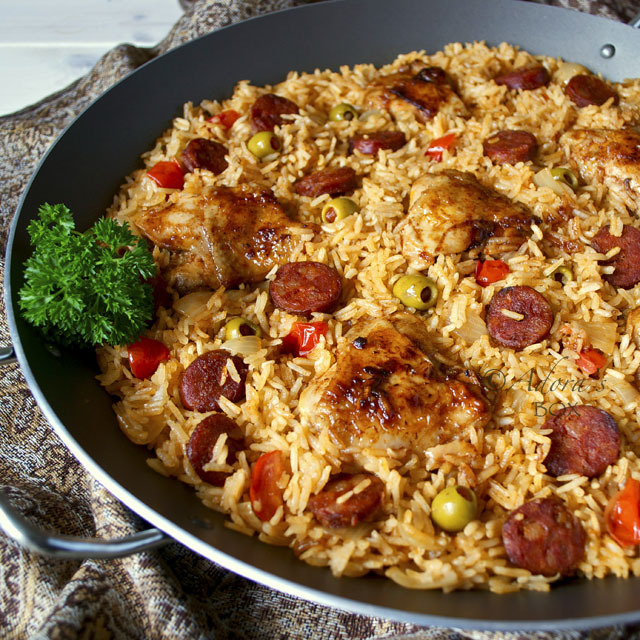 We make Arroz con pollo but this work so well!!!!! 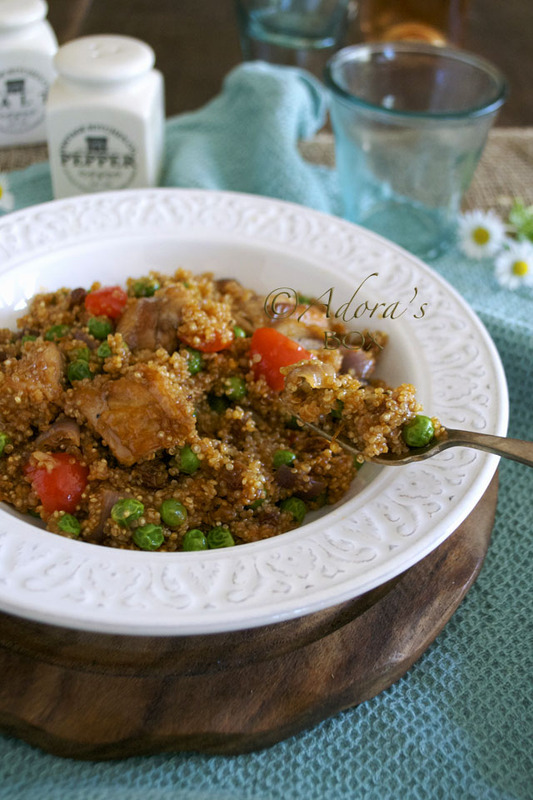 I love quinoa, the health benefits and cooking with it too. This is a great recipe Adora. Thanks for sharing! 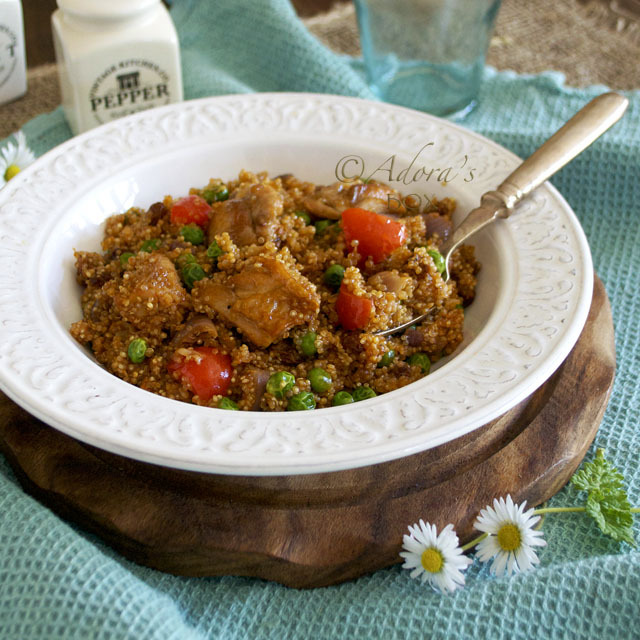 I love using quinoa in salad and even tried once as a risotto, but rich flavorful sauce are still the best accompaniment to it, beautiful dish!